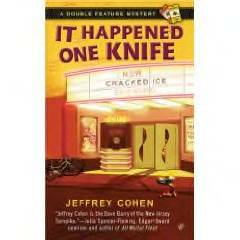 Fans of Jeffrey Cohen's SOME LIKE IT HOT-BUTTERED featuring Elliot Freed, the owner of Comedy Tonight (probably the only all-comedy film theater in New Jersery, or anywhere else for that matter) will be thrilled with IT HAPPENED ONE KNIFE. Readers new to the series will find a motley group of endearing characters, a suspenseful read, and lots of humor. Unless you have no sense of humor at all, I don't think you will be able to resist chuckling out loud as you read through the pages. Mystery number one is how did the only print of a movie disappear from the projection room? Only two people have the key to the room. One is Anthony, the projectionist who made the film and the other is Elliot. Mystery number two crops up when one of Elliot's favorite film comedic duos, Lillis and Townes, make an appearance at his newly refurbished theater. One of the aging comedians claims the other killed the woman they both loved fifty years ago and got away with it. Far fetched as it may sound, Elliot decides he must learn the truth about her death. If you're looking for a quick, fun read IT HAPPENED ONE KNIFE will do nicely. I'm already looking forward to the next Elliot Freed adventure and I hope all of the quirky, lovable characters return.